As predicted in my last post, I did cast on my Hitchhiker scarf over the weekend, which was easy, since the cast on row consists of only two stitches. The pattern is very clever really; you always increase on the toothless side (with a one row exception) which gives that edge the lovely curvy shape. The pattern is worked in sets of eight rows, with one tooth being formed with every set. As you consistently increase by nine stitches in each set and only cast off five (the horizontal edge of the tooth) the scarf gradually grows outwards. Anyway, I digress. This was my progress as of yesterday. I was going great until somewhere around tooth ten, which was reached on Saturday night, whilst channel hopping and eating Malteasers (other choccies are available). I was reminded of why I fell out with knitting. I don't possess the necessary skill to knit backwards or to retrieve dropped stitches and I usually end up having to pull the whole lot of the needles (apparently known as 'frogging' so I'm told) and starting again. I was determined to rescue my mistake and did eventually succeed in picking up all those tiny little 4ply loops with an even teenier DPN and managed to make a good impression of a salvage job. Tooth ten looks a bit different than it's pointier brothers but nonetheless, it's staying. I did manage to discipline myself enough to finish my zigzag baby blanket before casting on the Hitchhiker; I am really really pleased with how it looks and will be taking it with me to Larmer Tree. Thank you to everyone who has complimented me on it so far, it really means a lot. In the end, I decided against my original plan of doing two rows of trebles along the long sides as I felt that my beginners luck in shaping the corners might not extend to a second row. Sometimes knowing when to stop can be an art form! 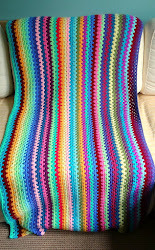 Since I managed to complete this project in under a month by utilising time that would normally be spent just sitting (on the bus, in the park, waiting for a train, watching rubbish TV with a bag of sweets) I decided that I should have enough time before the festival to hook up a sister blanket. The pattern I decided on for this one is from Lucy of Attic24. You can view it here. I decided I would have to learn the mysterious tr2tog stitch and it turns out that it's really not that difficult, especially following Lucy's excellent instructions. I'm using Rowan Handknit Cotton again, which I have really come to love working with, it seems to suit crocheting perfectly. This time I am using less colours, and dividing each colour strip with a half-stripe of a lovely crisp white. I have done a thick wedge of the gorgeous mauvey-purple shade at the bottom, which I will repeat at the other end and the around the sides at the end. There is also a green shade to be added (the same one as the darker green of my first blanket). This pattern will not be random like the first, but a repeat. I didn't consciously plan to used red, white and blue together in the design, but I think my aforementioned scrambled brain carries on blithely without me sometimes, and sometimes things work out all the better for that. Next week we are camping in the New Forest and it has been pointed out to me that it might be unwise to take a crochet project that involves a beautiful white yarn to a place where cleanliness may be somewhat compromised. With this in mind I have decided to take my Granny Stripe to work on, and no doubt some other little portable bits of stitchery that are festival-bound. I wish you all a lovely Bank Holiday weekend however you are celebrating (or not) the Jubilee and look forward to updating you on festival and non-festival progress again soon.